Nasal polyps don’t sound too pleasant by name and certainly they are not. They are a common, debilitating condition that can significantly disrupt quality of life. What are they exactly? They are growths that can occur inside the nasal passages and sinuses. Complications from nasal polyps as well as chronic sinusitis mean that the current medical approach may not be satisfactory. And that, of course, is where alternative medicine can step in to fill the void. Rarely do you see herbs or acupuncture as the focus of treatment for nasal polyps, at least among English-language studies. Chinese texts have in all likelihood explored such links carefully. A new study sought to review this topic and to share with everyone a specific case of nasal polyps. The patient, an Australian, suffered from nasal polyps and chronic sinusitis even after four surgeries to deal with the polyps. Still, the frustration continued as the polyps kept recurring. So the study used a special Chinese herbal formula, along with acupuncture, to help clear the problem. This is a typical approach in Traditional Chinese Medicine: the combination of herbs and acupuncture. The herbs were intended to lower inflammation involved in the nasal polyps. Those herbs also had antibacterial and antifungal abilities that may have played important roles in the treatment. The results showed that large amounts of mucus disappeared in the nasal cavity. And it showed that nasal polyps did not recur. In that individual, amazingly, there was no recurrence for three- and-a-half years. The patient reported having, clearly, a much greater quality of life and a much easier time breathing. Because the herb and acupuncture prevented the recurrence of nasal polyps, further research is needed to see if the ancient Chinese wisdom that helps patients can work effectively in this way. Acupuncture has been around for at least 5,000 years, although it has only gained notoriety in North America in the last 50 years or so. It uses a very precise system of points along the body. These points are suspected to all connect to the inner lines of Qi inside the body. Qi is the energy that flows through us and keeps us healthy. By balancing the flow of this energy, the practitioners of this age-old art aim to prevent and treat a range of illnesses. 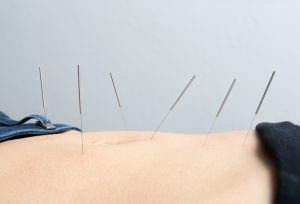 The most discouraging part of acupuncture for many patients is the use of long, thin needles to activate these points. Seeing the tray of needles could make some people faint. However, oddly enough, most people who actually go through with acupuncture say it isn’t painful at all.